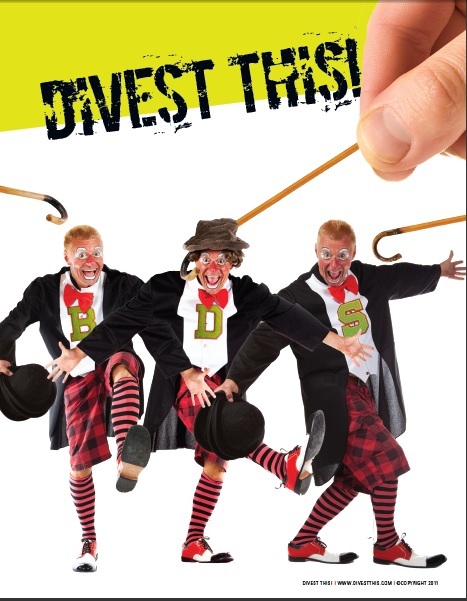 Berkeley Divestment – Everyone Loves a Circus! Word on the streets is that an override vote on the UC Berkeley divestment veto may not take place tonight. If that’s the case, I may move onto other topics between now and whenever that vote happens. But not before alerting the friends I’ve been making at Berkeley about the fun they can expect when “The Circus” comes town! “The Circus” is what shows up whenever a civic institution (like a university, city, or church) wittingly or unwittingly flirts with a divest-from-Israel campaign. It consists of students, citizens, or church members who once smiled at each other on the streets waving bloody shirts and gruesome photographs at one another. It includes people with honest political differences branded as “enemies of human rights,” or murderers with “blood on their hands.” Seminars or “teach ins” designed to demonize one side of the conflict and bury all information that does not support a black-and-white storyline of villains and victims replace thoughtful learning under the circus tent. As does the incessant meddling in the affairs of an institution by partisans worldwide, trying to push the organization one way or another. While I and other anti-divestment activists outside of the university could reasonably be criticized as being some of those “incessant meddlers,” I should note that we are not advocating for Berkeley to take an official stand that brands our political rivals as enemies of human rights and freedom. While some of us may act thoughtlessly during the course of this debate (and apologies right now for any hurt my writing to date has caused anyone), no one I know of who has organized against Berkeley’s divestment policy has ruthlessly pushed the school into officially condemning and threatening to punish the massive human rights abuses visited on Israeli and Arab alike by Israel’s Middle East neighbors. When The Circus came to my former home of Somerville Massachusetts years ago, our normally sleepy Alderman’s chambers became a noisy, hysterical big top, with partisans flinging accusations of racism and anti-Semitism, photos of ravaged bodies pushed under people’s noses, and – when divestment was finally defeated – the site of a near riot. While heat was the goal of divestment advocates during the miserable months divestment wreaked havoc on the city, The Circus managed to shed enough light onto the city’s leaders, helping them understand that this was not an issue that belonged on their agenda. Now a college campus is different than City Hall, at least with regard to the range of issues (local, national and international) that are routinely discussed and debated within the institution. Yet once talk turns into democratic action within the hall of an elected body (even allowing for some level of informality within student government), it’s reasonable to expect a certain level of decorum and gentility to accompany such a debate. Now there is the basis for a forthright airing of competing, but legitimate views! A theme in everything I have written is how much divestment asks of institutions, and how little it gives in return. For divestment advocates, UC Berkeley like the Presbyterian Church, the city of Somerville, and other groups are not civic institutions made up of thousands of individuals, all facing their own unique challenges. No, for those pushing hardest to make BDS the official policy of Berkeley’s student government, UC Berkeley is simply a prop, an organization with a 150-year-old reputation that can be leveraged to help divestment activists punch enormously above their actual weight. Student Senators need only look around to hear about issue after issue (tuition increases, service cuts, etc.) that can have enormous, long-term impact on themselves and their constituents. Divestment, on the other hands, is on the school agenda not by necessity, but by choice. As you watch The Circus put up its tents and park itself for the weeks and months it might take to wring divestment fully out of Berkeley’s system, it might be worth asking why someone else’s propaganda campaign must be put at the top of everyone’s agenda. 3 Responses to Berkeley Divestment – Everyone Loves a Circus! If they had the votes they'd put their resolution on the agenda tonight. There have been defectors from the 16 who initially supported this evil resolution. Tonight is a big, big, big anti-Zionist fundraiser. Anyone who's anyone in the local world of Israel bashers will be there. If they had the meeting today, no one would show up. And sit down for this one. The fundraiser is …. wait for it….an anti-Zionist seder! Yeah, its on the wrong day, yeah its in a church, but if “genocide” can mean whatever they want, if “apartheid” can mean whatever they want, well, then “seder” can mean whatever they want. I don't know about you folks, but my Hagadah says things like “Next year in Jerusalem”.